Scientific Name: Order Coleoptera, family Chrysomelidae, Diabrotica spp. Striped Cucumber Beetle--Acalymma spp. Identification: Adult spotted cucumber beetles are greenish yellow with small black heads and eleven (some people say twelve) black spots on the back. Two of the spots on the back of the beetle run together, making one butterfly-shaped spot, so this insect is sometimes called a twelve-spotted cucumber beetle. Larvae are beige with brown heads and a brown spot on the last segment. Eggs are oval and yellow. 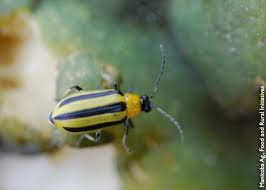 Striped cucumber beetles have stripes instead of spots and are smaller. Biology & Lifespan:200 to 1,200 eggs are laid in the soil at the base of plants. Larvae bore into the roots of plants. One to four generations a year. Adults overwinter in plant debris and mulch. They become very active in the spring. Habitat: Beans, corn, cucumber, eggplant, melons, peas, potato, squash, tomato, and several fruit trees. 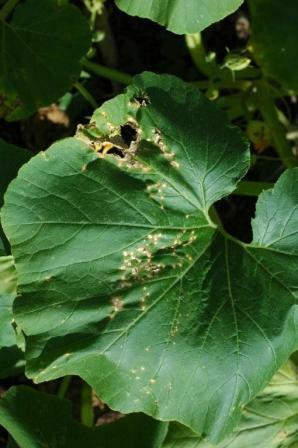 Feeding Habits: Adults chew ragged holes in plant leaves, flowers, and fruits. 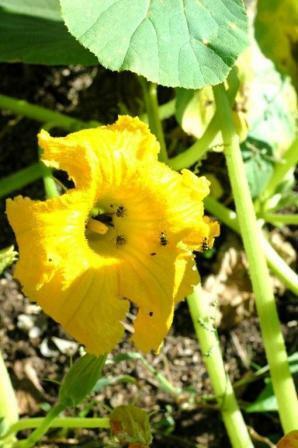 They like cucumbers and cantaloupe primarily. Larvae eat plant roots and stems. Economic Importance: Eat plant flowers and foliage and transmit brown rot to stone fruits as well as bacteria wilt and cucumber mosaic. Natural Control: Tachinid flies, soldier beetles, toads, and assassin bugs. Organic Control: Use cover crops and beneficial nematodes. Garlic-pepper-seaweed spray. Use neem and citrus products for heavy infestations. Inoculate seed with beneficial nematodes. This is the easiest and cheapest control. Cover plants from planting to flowering with floating row cover. Add yellow sticky traps. 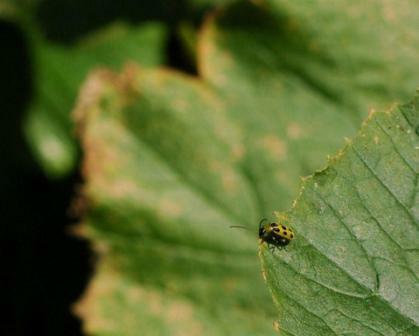 Insight: Spotted cucumber beetle is the adult of the southern corn rootworm and is most damaging to young corn. This larva can severely damage the roots of corn, especially sweet corn in poor growing conditions.